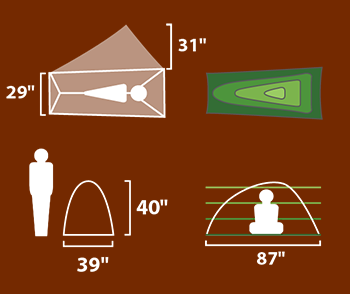 I have used a number of tents over the years of my adult life, and each one fit the activity I was doing at the time. As a trike hobo, I pedal myself over the landscapes of this planet with a minimal amount of cargo, simply because weight makes my treks much more difficult. 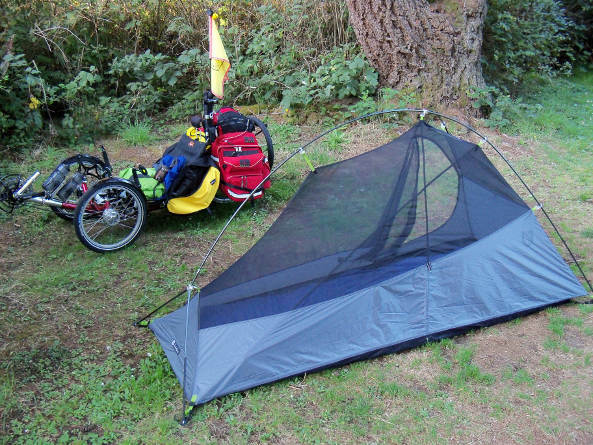 Fast and light are my two watchwords as an overland triker, and I have finally reached a tenting solution that meets my needs perfectly! No longer will I pedal the planet overloaded with heavy cargo! 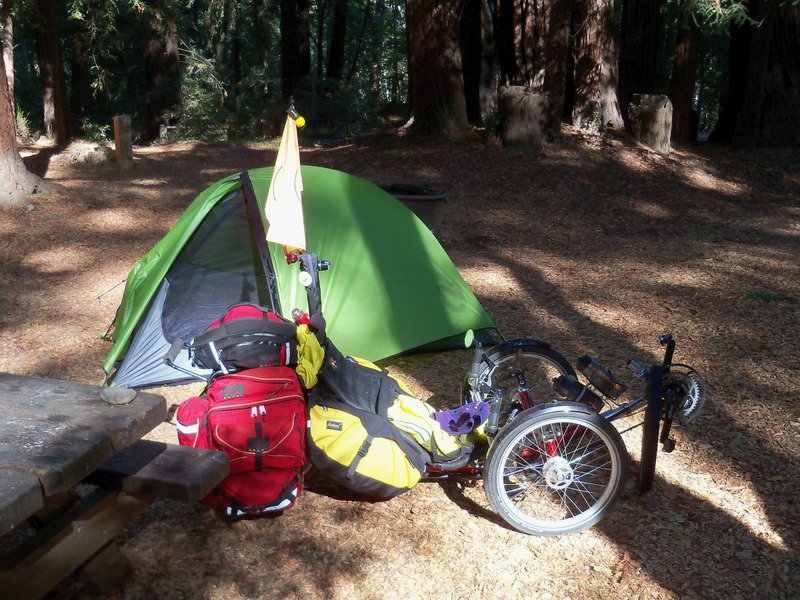 The NEMO Obi 1 next to the trike, for sizing comparison – makes for great wild stealth camps. 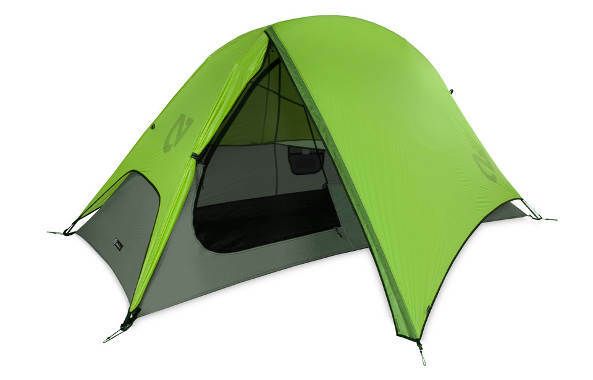 The NEMO (New England Mountaineering) company makes a variety of fine tents, that routinely rank at the top of backpacking reviews in magazines and on forums. For a single person on an adventure, they manufacture an ultra light one-person tent that sets up and breaks down in record time, and with unbelievable simplicity and ease! 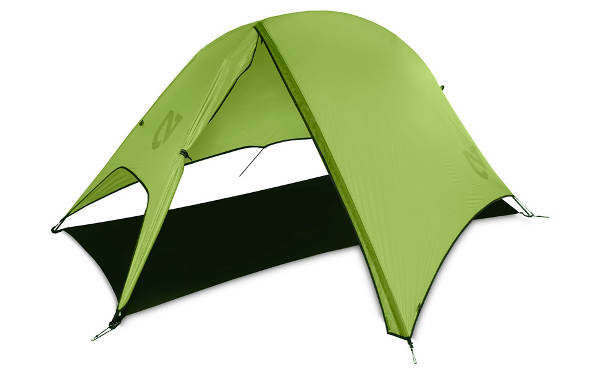 The NEMO Obi 1P (one person) is my tent of choice, a true “keeper” if I ever have had one. The Obi has been on my team since 2011, and I recommend it without reservation if you seek the maximum ultra light and small tenting option. Click HERE to visit the NEMO Obi webpage directly. 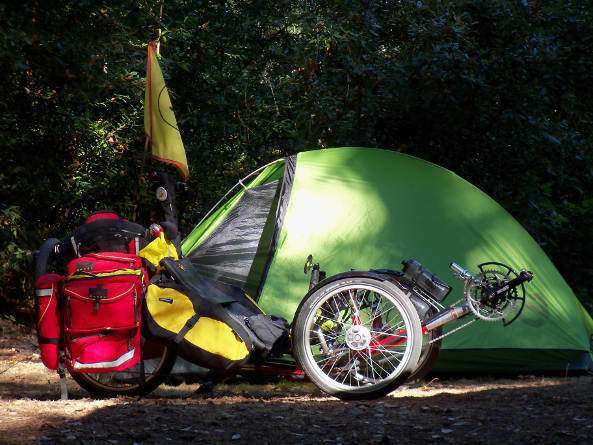 Of course, the small size does not allow for much in the way of gear to be stowed inside at night. If you wish to keep your gear within arm’s reach, you must stow it in the vestibule area. 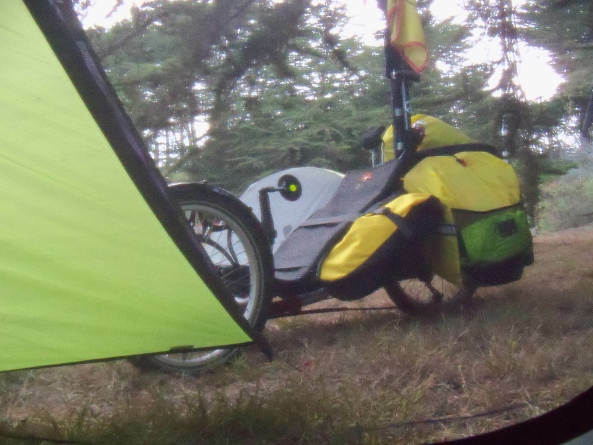 I keep my cargo on the trike, with the rear of the trike right next to the tent’s door (see photo above) – close enough to easily monitor as necessary. I also place a little bear bell on my flag pole, so if a critter messes with my trike at night, the bell awakens me quickly. 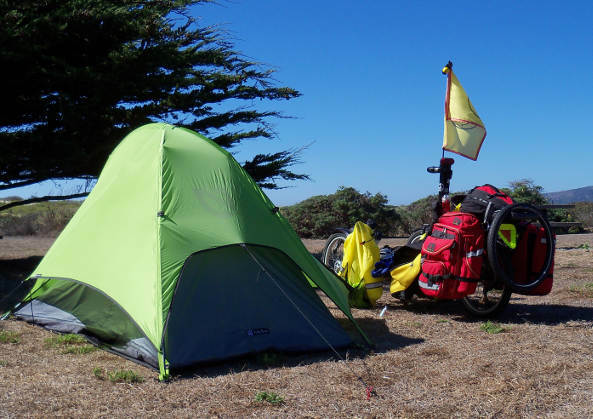 My food is stored in odor proof bags, so animals don’t even know it’s there in my panniers (this is my one concession to use this tent, as I used to bring my bags inside my older, larger, and heavier tents. 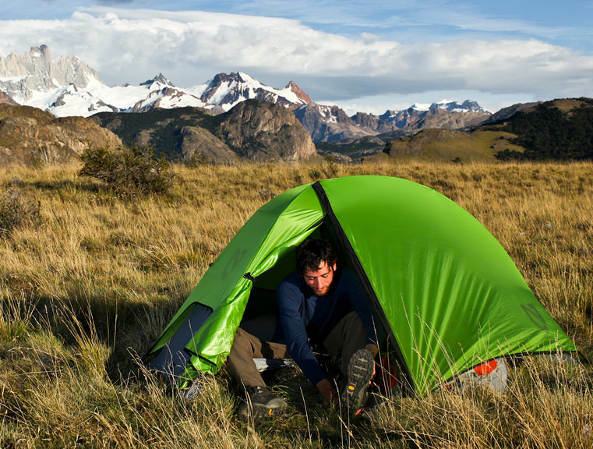 This tent maximizes ventilation with mesh, so condensation is a thing of the past. 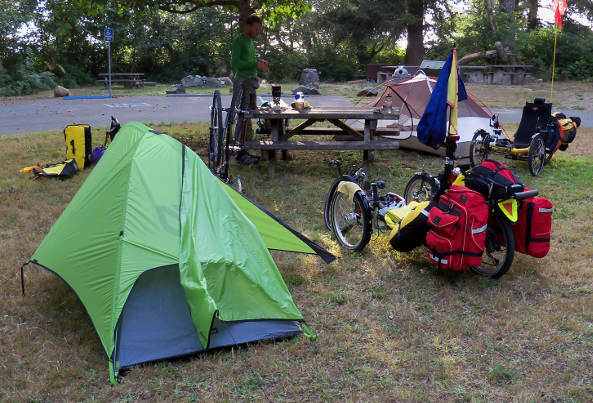 It is not a four season tent, but will do the job most of the time for trike tourers, who attempt, whenever possible, to pedal cross country in the driest weather they can find. 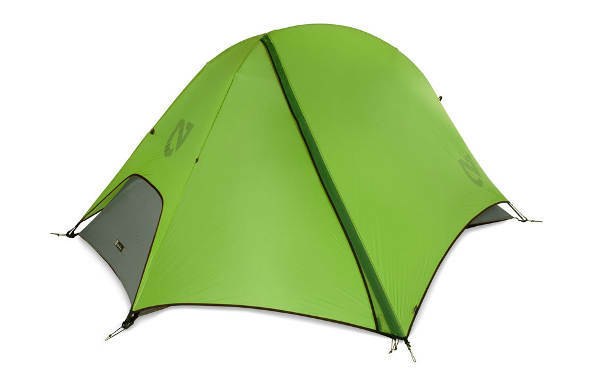 The fly sheds water well, and does not contact the tent, so no moisture is transferred into the tent. Please visit the NEMO Obi website page for further information. 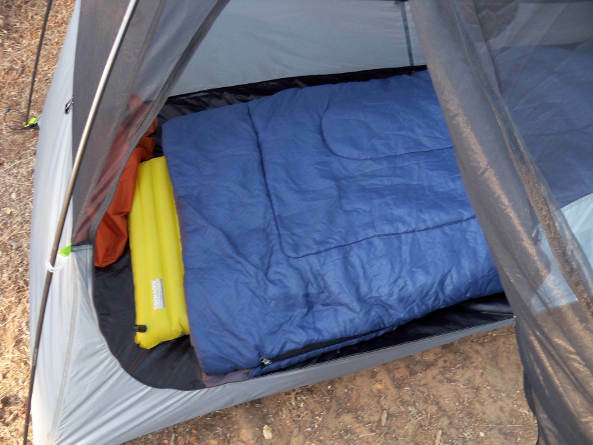 This is a true minimalist’s tent, perfect for sleeping and shelter, but not much else. 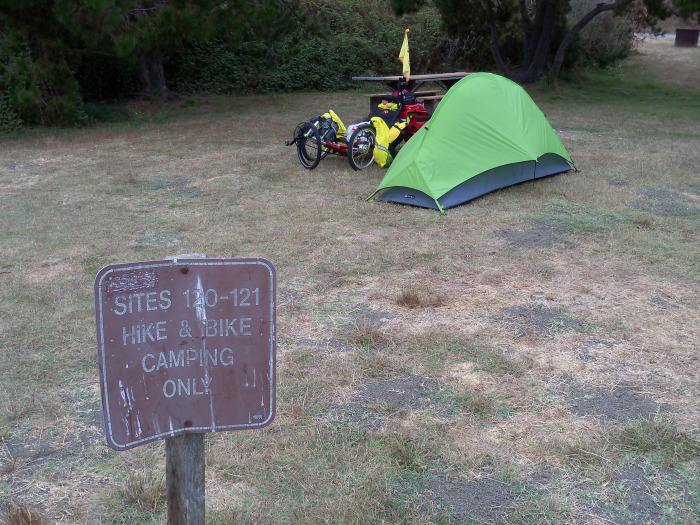 My NEMO Obi tent and trike camped at Big Sur on the California coast. 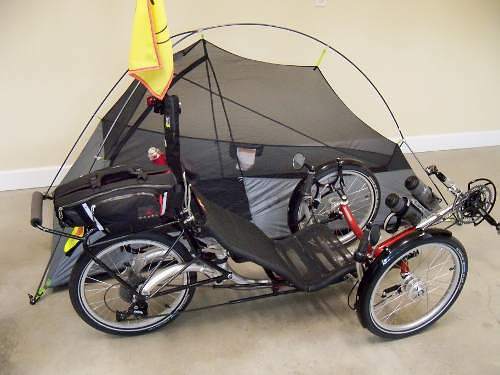 For more photos of this tent on the road, click HERE. The Obi™ tents are the black belt martial artists of our lineup. They are finely tuned instruments, with not one ounce of material wasted, every feature and detail driven by purpose and strategy. 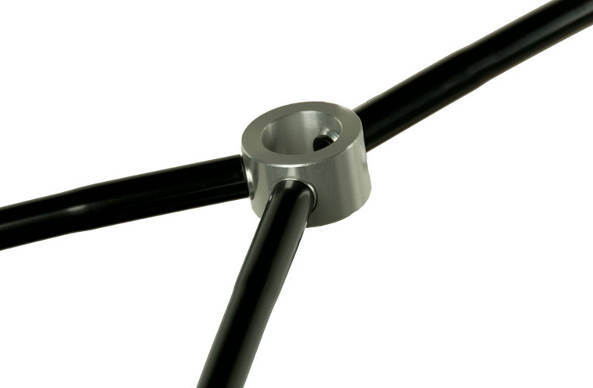 Subtly moving the front pole hub overhead gives the pole skeleton shoulders, creating more interior volume without the need for an additional ridge pole. A raised waterproof tub floor allows cutouts in the fly to save significant weight while improving ventilation. 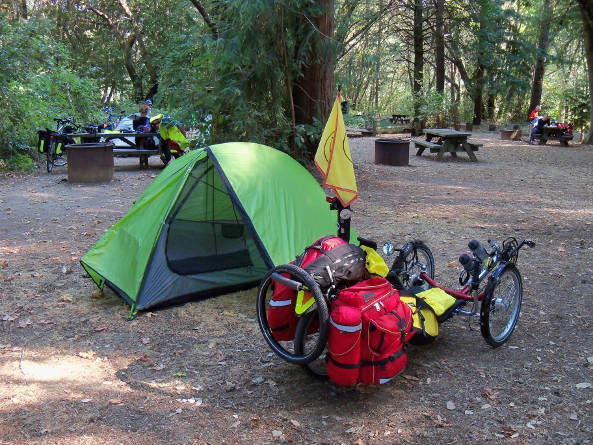 Obi™ 1P includes a vestibule perfectly sized for tucking in your pack and shoes at night and large side vent to keep a cross flow of air.